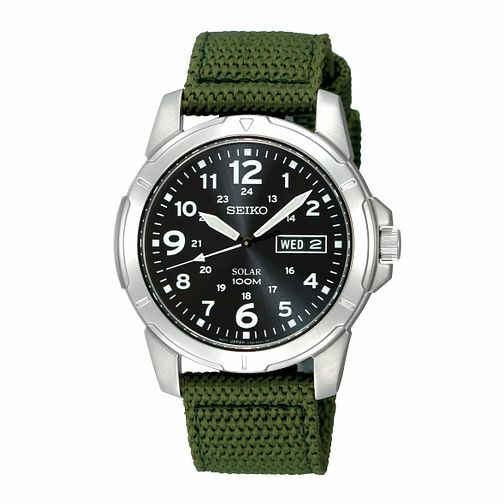 Give your look a tough urban edge, with Seiko's army inspired dark green canvas strap watch. Featuring a chunky round black face, with bold modern numerals in white. Water resistant to 100M. Powered by light and artificial light. Seiko Men's Green Nylon Strap Watch is rated 4.3 out of 5 by 4. Rated 2 out of 5 by Anonymous from 1st Solar Watch I was quite excited about my new watch but despite having it for a week I could not get the battery to charge/hold a charge despite leaving it in the sunlight all day. I took it to my local H.Samual store who exchanged it but I had the same problem. We both came to the same conclusion that the watches were reacting negatively to me. I have heard of it previously but this is the first time experiencing it. The strap is clearly a cheap version as it kept snagging my clothes unlike previous straps of this type. I have since changed back to a Kinetic movement and all is well.